I’ve spent a lifetime dissing the dishcloths. Peaches n’ Creme my stash? No way. 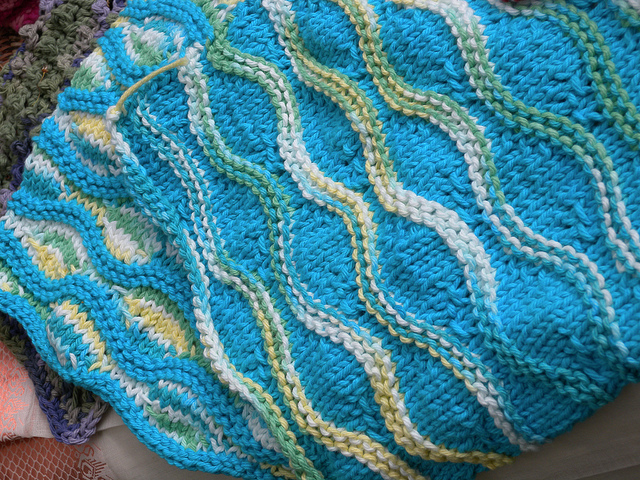 But now I find myself with no time for Just Jared because I am spending all my nonFacebook time with “Dishcloth Weekly Knitalong” on Ravelry. Whodathunkit? 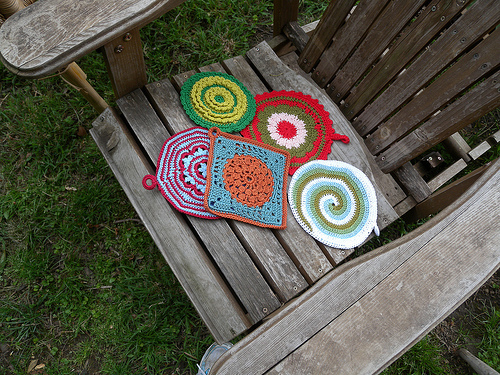 Profoundly inspired by the Linoleum Dishcloth that Lynn recently excavated from Mason Dixon blog, the knitting women decided to have our own Dishcloth Swap this weekend, our very own Mother’s Day Dishcloth Love-In Extravaganza, hosted by Ana in her giant back yard. Here are two fine examples of Lizard Ridge, available as Rav downloads. This is a ridiculous amount of knitting for something you use to clean, but it gives you a good workout for perfecting your w&t stitches. The only one that is an actual pattern is the one in the upper right hand corner, called Clover Tweed. The patterns for the rest came to me in a dream. Beautiful! So glad to see you are back! 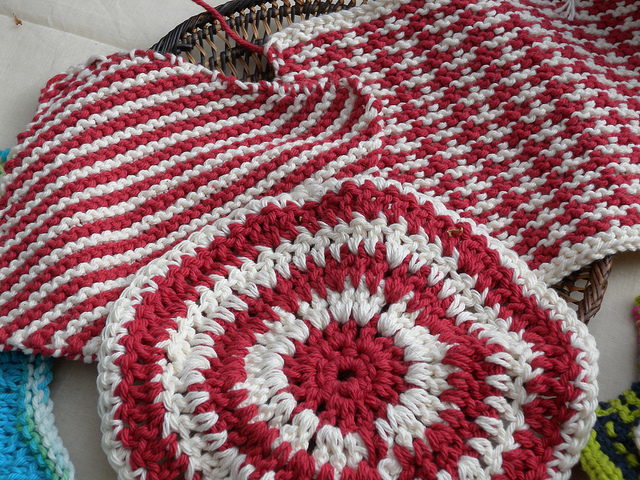 I have been wanting to knit that dishcloth – maybe this will be the push I need! Knitting A Mile Square is powered by	WordPress 5.1.1 and delivered to you in 0.248 seconds using 40 queries.